Yes, we do provide everything and anything for the well-being of our seniors and we do it with pleasure around the clock, 7 days a week. - Three meals and snacks throughout the day. - Special diet as prescribed by a doctor can be accommodated. - Assistance with prescribed medications per physicians instructions. - Observation for changes in well-being and notification of family and/or physician as needed. - Assistance with dressing, grooming and bathing. We do believe in the philosophy that a healthy mind and body go hand in hand and are trying to incorporate exercise and mind stimulating activities according to interest and abilities. Anything from walks to board games to painting is supported and we are always open for suggestions. Just say the word and we will make it happen. Above list is by far not complete and being a smaller facility we can accommodate individual preferences easier. 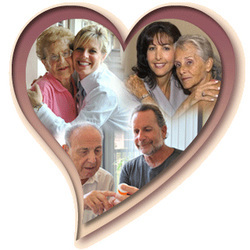 We pride ourselves in the quality and the flexibility of our care. Whether you like to sit outside on the porch and read the newspaper or enjoy feeding the birds in the backyard or whatever else your heart desires, we are here to make sure it will get done.